The big-pickup market is a fiercely competitive segment, and one in which, despite the high overall volume, brands battle mightily for even incremental sales. 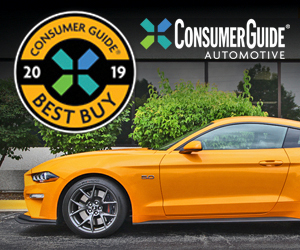 When General Motors rolled out the current-generation Chevrolet Silverado and GMC Sierra for the 2014 model year, it did so with a jealous eye on Ford’s share of the high-end truck market. Indeed, with its Lariat, King Ranch, and Platinum models, Ford had a strong hold on the growing number of buyers for $50,000-$65,000 “premium” pickups. Our test truck’s Deep Ocean Blue paint is a $495 option. For 2014, Chevrolet flanked Ford by rolling out the Silverado High Country, a high-zoot trim level positioned between the previous top-line LTZ model and GMC’s swanky Denali models. 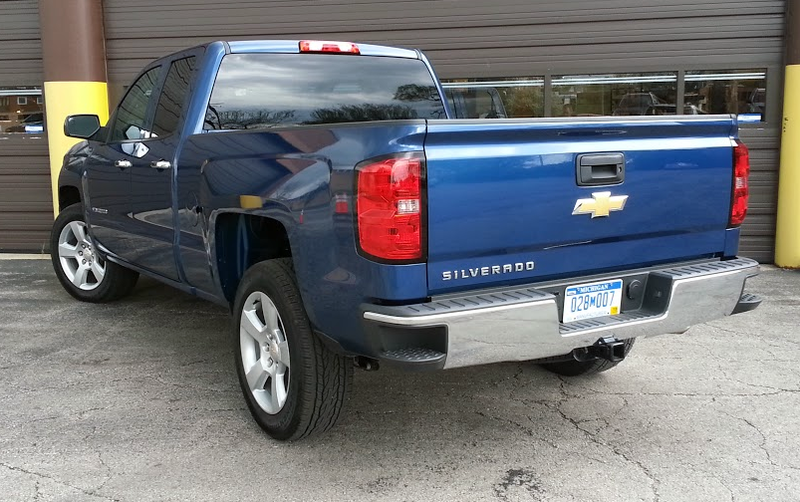 Having buttressed Silverado at the high end of the market, it was time to see what could be done at the entry level. 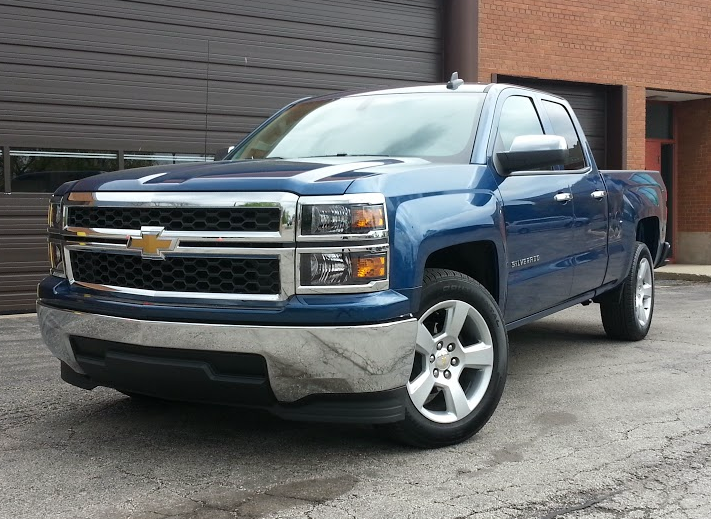 While strong in the middle of the market, Silverado was facing serious competition at the low end of the field, and that’s where our test truck—the 2015 Chevrolet Silverado LS Double Cab with the Custom Package—comes in. 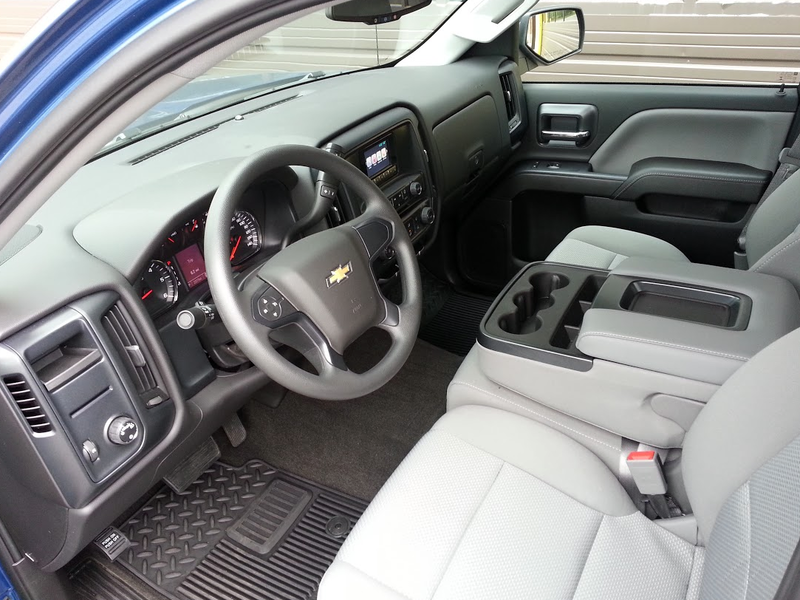 In LS trim, Silverado’s cabin looks and feels sturdy, but lacks the upscale ambiance of higher-end LT and LTZ models. Chrysler’s Ram brand has been enjoying success with its Big Horn model, a high-value entry-level pickup aimed at shoppers looking for a truck comfortably under $40,000. (For those of you unfamiliar with the current truck market, the average transaction price of a new pickup is now more than $42,000.) To counter the Big Horn (and the Lone Star, Big Horn’s Texas-market sibling), Chevrolet introduced the Custom Package. Available only on extended-cab models in LS trim, the $1290 Custom Package includes 20-inch silver-painted aluminum wheels, chrome bumpers and body trim, and, when ordered with the standard V6, a locking rear differential and trailer towing package. Chevrolet offsets the package price with a $1700 “Custom Package Discount”, reducing the price to a net savings of $1805 (including the price of the locking axle and tow package) on V6 models, and a net discount of $410 on V8 models, not including the $1095 price of the V8 engine. The Custom Package wheels and bright trim bits do their job, sprucing up the value-oriented pickup’s visage nicely. The editors of Consumer Guide are rather used to evaluating fully loaded vehicles, so the cloth seats of our test truck came as a bit of a surprise, but they present well and are perfectly comfortable. I’ve long been a fan of General Motors’ 5.3-liter V8, and the update the engine received for 2014 makes it even better. Boasting direct injection, variable-valve timing, and cylinder deactivation, the “EcoTec3” 8-cylinder supplies more power than most truck owners will need, while going fairly easy on the gas. We averaged almost 19 mpg over almost 240 miles of testing, a figure that only recently would have seemed impossible for a V8-powered large pickup. In Double Cab form, Silverado’s rear seat is best reserved for smaller passengers. The LS trim’s cabin décor is something nicer than work-ready. Materials seemed a cut above entry level, and assembly quality met expectations. It is inside the Silverado, however, that I found two issues worth taking note of. First, for whatever reason, the Silverado seriously trails the Ram 1500 and Ford F-150 when it comes to headroom. At a not-too-tall 6’1”, I shouldn’t have to feel the headliner scrub against my buzz-cut head. Second, Work Truck and LS Silverado models are not equipped with Chevy’s MyLink infotainment system (which includes a handy 8-inch touchscreen). Instead, entry-level Silverados make do with a non-touch 4-inch screen that is controlled, awkwardly, by the buttons and knobs around it. The system works, but it’s not as simple to use or as intuitive as the MyLink arrangement in pricier models. On the road, the Silverado rides well, absorbing road imperfections more like a premium sedan than a half-ton pickup. Likewise, the cabin is largely free from wind and road noise. Though the Silverado handles well for a vehicle of its size, it trails the Ram and F-150 for cornering ease and steering feel. What the Silverado LS with Custom Package gives up to trucks listing for $10,000-$15,000 more is mostly trim and convenience content. Fundamentally, this budget-priced rig looks good, works fine, and doesn’t rival your average Lexus in price. Our Chevrolet Silverado LS Double Cab test truck was a pleasant reminder that the automakers still make regular-joe trucks in addition to the luxurious, optioned-to-the-hilt High King Laramie Country Ranch cowboy Cadillacs that seem to get all the press as of late. For a sticker price of $35,660, this Silverado LS with the Custom Package delivers basic big-pickup utility with a nice dose of exterior chrome to liven things up a bit. Still, getting a full-size new pickup for less than $40K these days means going without a few frills. The LS’s cabin is solidly assembled, but a bit drab. The dashboard is a sea of black, with precious little contrasting trim, and the gauge cluster looks pretty plain. And, compared to the typical touchscreen systems in most $30K-and-up vehicles today, the LS’s base radio screen seems especially small and a bit out of date. This is definitely not GM’s MyLink system, but nevertheless, the center-stack controls are very simple and easy to use. 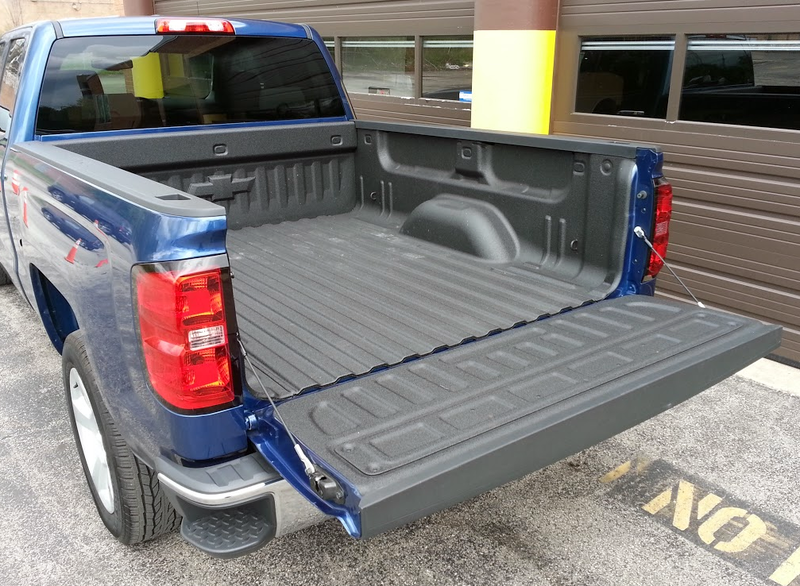 Our test Silverado’s bedliner is a $475 option. Note the handy steps built into the corners of the bumpers. The fabric upholstery feels sturdy, but not very plush, and the seat padding feels a bit spongy in spots. Like all Silverado Double Cab models, the back seat area is sized for kids, and the seat back is thinly padded and sits bolt upright. 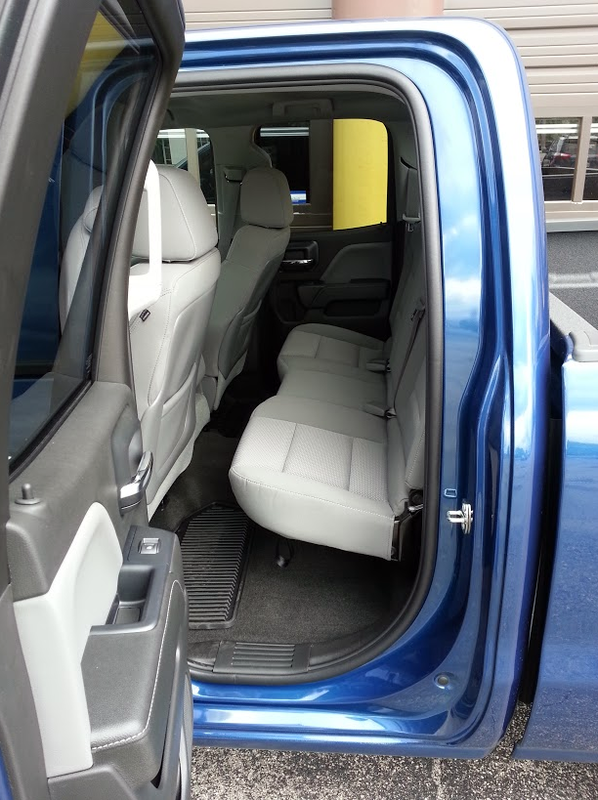 The high step-in and narrow rear door openings make entry and exit tricky. We were also a bit surprised to see that the tailgate had no easy-open damping or close assist, a feature that most decked-out pickups sport these days. That 1995 time traveler would likely also be taken aback by the Silverado’s gigantic size, and how tricky the typical full-size truck can be to park in close quarters. Which, in its own way, underscores the Silverado Custom’s value: This is a lot of vehicle for under $40K. Written by: The Daily Drive staff on June 10, 2015.on January 31, 2018.